You might think your dual or even triple monitor setup is the best thing since, well flat panel monitors came out but you need to think again. AMD this week unveiled the next leap forward in multi-monitor setups, Eyefinity. ATI Eyefinity is powered by one AMD graphics card and will run up to 6 displays at up to 12 times 1080p high-definition resolution. To put that into perspective Full HD resolution is considered 1080p or 1920x1080 = ~2.1 megapixels. One ATI Radeon graphics card with ATI Eyefinity technology supports 2560x1600x6 = ~24.6 megapixels for 12 x full HD resolution. To show the power of the new technology representatives from AMD configured a group of six, 30" Dell 3008WFP panels as a single display, in a 3 x 2 arrangement, with a resolution of 7680 x 3200. Powering the displays was a SINGLE graphics card, with a SINGLE GPU, gone are the days of needing multiple cards to run more than two displays. In the video demonstration below you can see ATI Eyefinity driving Tom Clancy’s Hawks in a fully a immersive, panoramic gaming experience at an amazing 5760x2400 resolution spanning six monitors employing the single cards Display Port 1.1 interfaces. At a media event aboard the USS Hornet in Alameda, CA, AMD demonstrated 24 monitors hooked up to a single PC, driven by four Eyefinitiy-based cards. 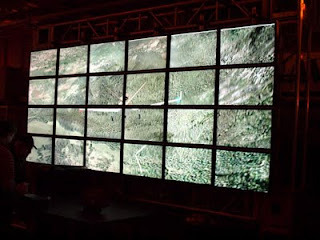 The four GPUs--each driving six 24-inch Dell LCD monitors--powered a 3D flight simulator across all 24 screens. Talk about some wow factor!!! Eyefinity will be available when AMD/ATI's new upcoming DirectX 11-based ATI Radeon graphics cards are released. AMD also failed to announce specific price-points, but did state that Eyefinity-based graphics will make it into desktops and notebooks "at very affordable prices".